There’s been a lot said and done on this complaint since our last update, last December. Now it is time to put it on line. 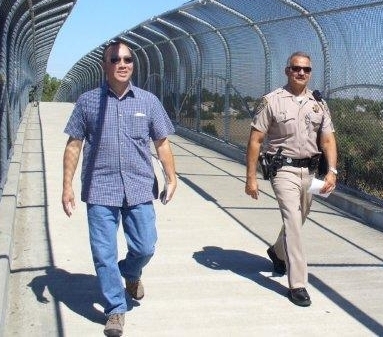 On September 11, 2010 we went freeway blogging in Davis and CHP Capt. Iketani handed us CHP’s response to our complaint (filed on December 4, 2009) and our follow up meeting with them in July. 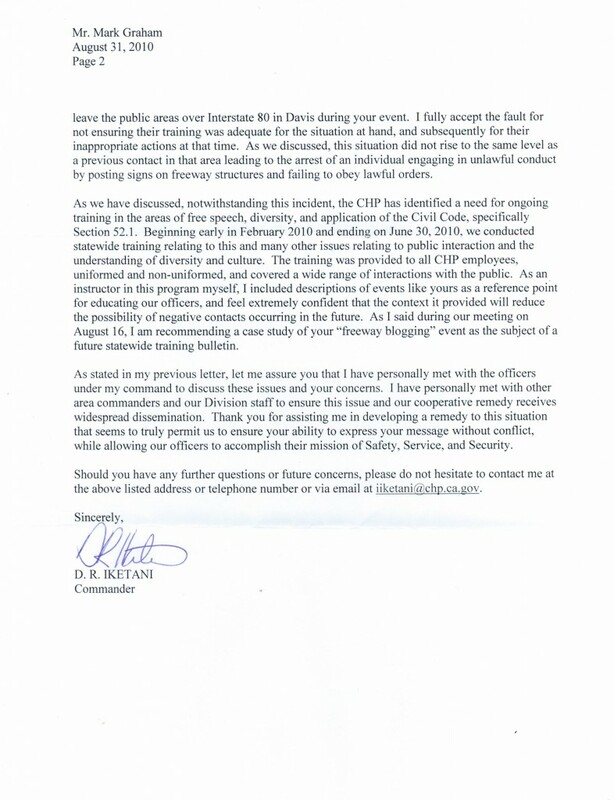 This is CHP’s final written response to our complaint. They did take action, such as using a case study on freeway blogging in their statewide training on free speech. They also implemented their deal with us. In short, there are separate but related matters here. One is how we cooperate with CHP in planning and carrying out our freeway blogging adventures. The other is the complaint that we filed in December 2009 and CHP’s response to it. The long and short of it is that we have reached a very satisfactory agreement with CHP on our freeway blogging adventures. 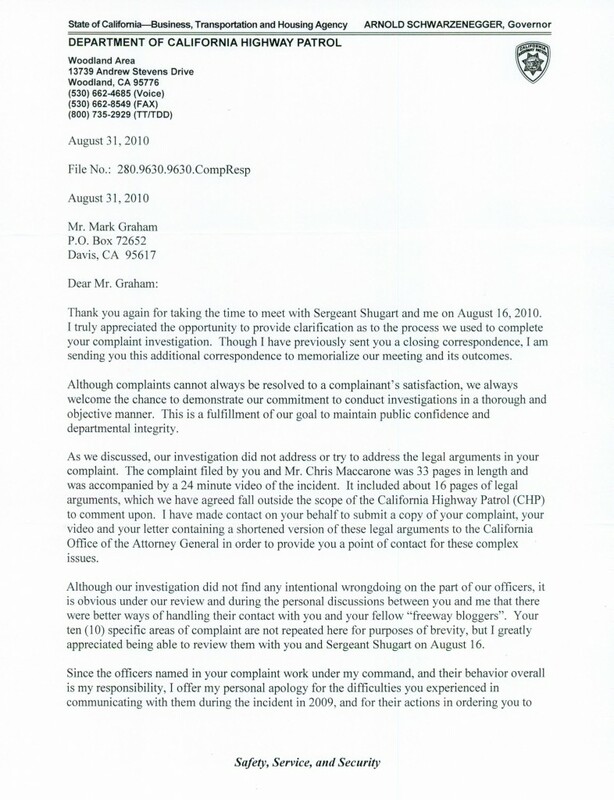 On the complaint, although CHP did not do as thorough an investigation as we had hoped (and as the law requires) they did disclose many of their findings in a face to face meeting, which matched what we said in our complaint, and the CHP’s letter of response addresses some key aspects of this whole thing. In particular CHP conducted a training that covered many aspects of interaction with citizens, including freeway blogging. They are even going to use this October 2009 incident as the basis for a training manual in the future. The detailed history follows. Happy reading! In February, 2010 two of us freeway bloggers met with Capt. Ike Iketani in the Woodland CHP office. We had requested a meeting to discuss freeway blogging and to find a way, in cooperation with CHP, that we could do our peaceful and constitutionally protected and safe demonstration without interference and that CHP could satisfy their obligations to enforce the law. We had a long conversation, 2 1/2 hours, and put everything on the table including our concerns about the September and October, 2009 freeway blogging events. What came out of that meeting was really a remarkable collaboration. We agreed on a procedure that we could use to facilitate just what we wanted. Namely, we would notify CHP prior to our next freeway blogging event of the date, time and place of the event. That’s all we would do differently. CHP would notify their officers, their dispatcher, and the Davis P.D. of our upcoming freeway blogging event. The upshot of it would be that when drivers called 911 (which they are not supposed to do because it is an emergency phone system) to complain about us and our banner, all of the above would know about it. We learned that when CHP does not know we are going to be out there, they react by treating all driver complaints as true and treating the situation as an emergency. Therein lies the problem, or at least a big part of it. We are greatly indebted to Capt. Iketani of the Woodland area CHP for his cooperation on this matter. We put the above procedure into action on our April, 2010 freeway blogging event. It worked as planned, which is to say perfectly. Capt. Iketani said he would drive the stretch of I-80 where we were and pay us a visit on the overpass, which he did. We made a video and one of us did an interview of Capt. Iketani for the radio. The video is not yet finished being edited, and it will one day. You can find the radio interview in the KPFA archives and I think the date is April 9 or 10. In any case Capt. Iketani observed what we were doing, observed the traffic, realized (and said on tape) that we were not breaking any laws or creating any unsafe traffic conditions or slowing traffic down, and let us continue. We had a nice friendly conversation. The next development came in May, 2010 when CHP sent us the long awaited results of their investigation. (It may seem like this page is jumping back and forth on topics but they are very closely related, the complaint and investigation with the cooperation.) 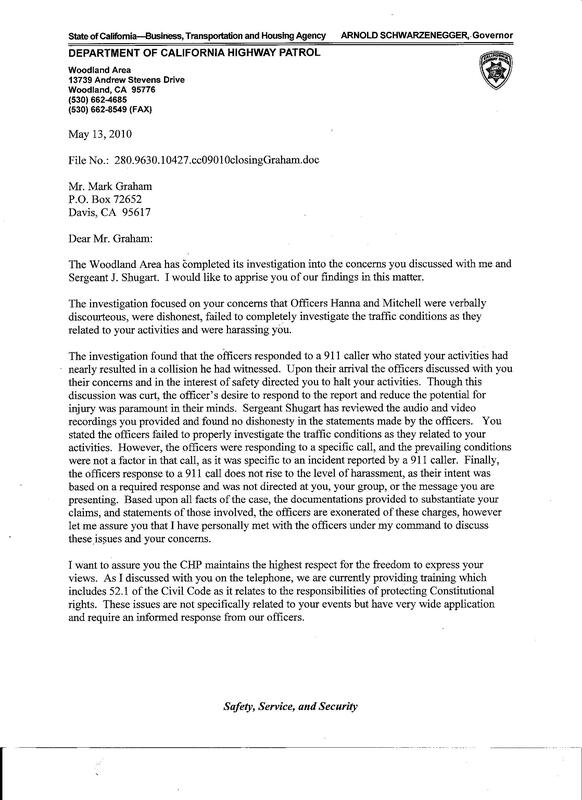 The letter from CHP, dated May 13, fell far short of what we wanted and of CHP’s obligation, which is to conduct a “thorough” investigation and to make a determination as to any claims of wrongdoing. Unfortunately, CHP had taken over 5 1/2 months to investigate our 33 page complaint, accompanied by a 24 minute video, carefully prepared, and had come up with only a 1 1/2 page report in response. That report was a whitewash. The investigation was really not thorough at all. Or at least the report didn’t reflect it. We had made ten (10) specific allegations in our written complaint, filed along with form 240B, and backed each one of them up with the specific statements that CHP officers Hanna and Mitchell had made to us. Our videotape provided the video and audio so there was just no question that they had actually said those things. We had made 16 pages of legal arguments explaining why the law, the California Codes and Constitution, actually allowed us to remain on the overpass and continue doing what we were doing in the way that we were doing it on October 9, 2009. The legal arguments, and I’m not going to repeat them all here, were about the lack of a factual basis for a lawful order, failure to monitor the traffic situation, pre-judging the situation, having a mission inconsistent with law enforcement, ordering us not to take actions in future unknown situations, lack of any California law, Code, rule or regulation that prohibits freeway blogging on State property, free speech, due process, probable cause, arbitrary and capricious, and inconsistent application of the law, a total of eleven separate legal arguments. CHP’s investigation absolutely ignored these legal arguments. Their 1 ½ page report on the investigation did not address them. We will post this May 13 2010 letter on this page for you to read. Subsequently I met with Capt. Iketani in his Woodland office in June to discuss this investigation and findings. I said that I was not satisfied with the investigation and explained why, including that all of our legal arguments were totally omitted. At the time, Capt. Iketani said that the person who conducted the investigation, Sgt. John Shugart, was not qualified to evaluate our legal arguments. That may be, but nevertheless CHP enforces laws, and the California Constitution and California’s laws (Codes, as we call them) protect our right of free speech. The California Vehicle Code, as this site has explained, gives CHP limited authority in very specific situations, using their discretion, to regulate traffic. This authority is what CHP cited, incorrectly in that case, in ordering us to take down our banner on October 9. To say that Sgt. Shugart is not qualified to address legal arguments only raises the obvious follow up question; then who is? CHP should have found somebody, either in CHP or in the California Attorney General’s office, who was qualified to address our legal arguments. If we had gone to court it looks like we would have won hands down. Imagine if the CHP’s lawyer had said to the judge, “Your honor, I am not qualified to address legal arguments, so I won’t.” That’s about the size of it. We are not attorneys but we had studied the law and knew enough to know our rights. In that situation on October 9, we knew that we were right. Unfortunately Sgt. Shugart was not available at that time, in June, because of his schedule. We went freeway blogging in June, 2010. We used our new notification procedure in cooperation with CHP. This time there were 5 or 6 of us. A CHP officer came by and told us, contrary to what was plainly visible, that he thought our banner was causing traffic to slow down. By then it was about lunch time and although there was some interest in the group for disagreeing with this officer, he was friendly and cordial and we decided to go to lunch. We would not necessarily handle it the same way next time. In August 2 of us freeway bloggers met with Capt. Iketani and Sgt. John Shugart at the Woodland CHP office. This time we finally got to discuss the investigation and its shortcomings. We found, not really surprisingly, that the investigation did uncover several areas of wrongdoing, which according to CHP’s policy for investigating citizen complaints were supposed to be mentioned in CHP’s report. Capt. Iketani said that the investigation did not uncover any intentional wrongdoing. Without agreeing or disagreeing as to whether the wrongdoing was intentional, we pointed out that CHP’s policy does not mention intent. It only says that CHP must make a determination of any claim of wrongdoing. We asked Capt. Iketani if, in light of that meeting and what he admitted to us in person in his office, he would be willing to send a new letter to report on the investigation. In other words a letter that acknowledged the wrongdoing that the investigation had found. Capt. Iketani said that he would. This was a big step forward. The report on the investigation needed to reflect the investigation; otherwise it appeared to be a whitewash. Subsequently Mark wrote a draft letter which could have served as the basis for CHP’s new report on its investigation and emailed it to Capt. Iketani. 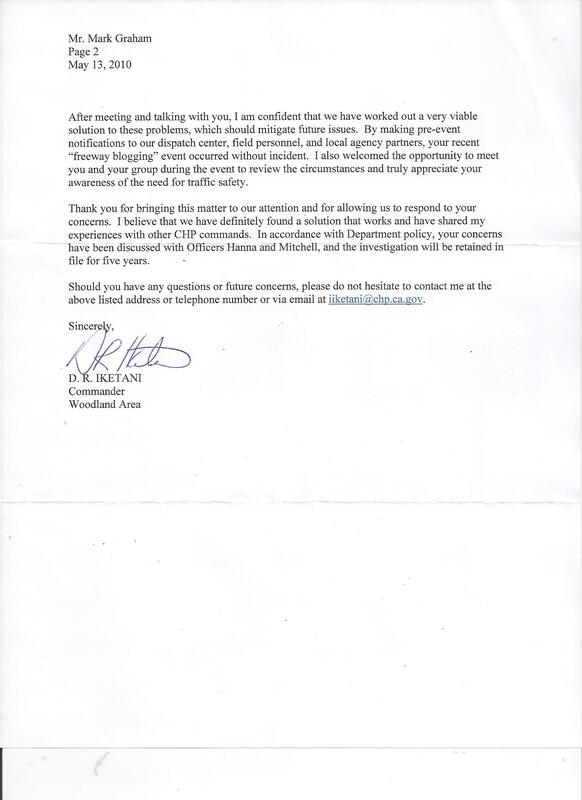 Naturally CHP was free to write its own letter but the purpose of providing this was to show what should have been included in CHP’s new report on the investigation. On September 11, 2010 we went freeway blogging again. By this time Capt. Iketani had been promoted to the Sacramento office. Mark had spoken with Sgt. Ruiz in the Woodland office, and of course had notified Capt. Iketani and Sgt. Shugart back in August, that we would be freeway blogging on September 11. Both Sgt. Ruiz and Capt. Iketani paid us a visit, together, on the overpass on 9/11/10. Once again we had a friendly conversation and cooperation. They said that they felt our banner was causing the east bound traffic to slow down. We looked and it did appear that the traffic was moving more slowly before (west of) our overpass (yes by now we claim it as ours, the bicycle and pedestrian overpass in Davis) than after (east of) it. Whether this was due to our banner or not, at least the effect was there. We knew enough about the California Vehicle Code Sec. 2410 to know that CHP has the authority to regulate traffic to expedite it, which could be interpreted as the authority to order us to move our banner. Capt. Iketani and Sgt. Ruiz asked us to move our banner over to face the westbound traffic, which on this Saturday morning was much lighter and moving along much more quickly. We did. They stayed to observe what happened. They said it would take 5 minutes or so for the delay in traffic at the overpass east bound to work itself out. Ultimately they allowed us to continue our freeway blogging and departed. Note, dear reader, that they did not order us to take our banner down. And unlike the October 2009 run in, there was no intimidation and no threats of arrest or jail. During that conversation Capt. Iketani gave Mark CHP’s new report on the investigation. That’s what this whole update was getting to. You can read it on this site. This report is much MUCH better than the one from May 13 in terms of stating the reality, the findings of wrongdoing by CHP officers Mitchell and Hanna, but it is very lacking in specifics. The letter speaks for itself and you might guess, if you didn’t know this whole history, that there is more to the story than meets the eye. A lot more. You would be correct. The draft that Mark sent to Capt. Iketani after the August meeting spelled out the 6 areas of wrongdoing which Capt. Iketani had admitted in person in his office. Why then, couldn’t CHP admit these in writing? We do not know. In any case, this is where we are as of mid September, 2010. We feel that we have come a LONG way in terms of cooperation with CHP, in terms of opening the door to our peaceful, Constitutionally protected free speech demonstrations, and in terms of learning how to get things done. There is one more piece to this puzzle we are waiting on. At the June meeting, Capt. Iketani offered that if Mark would write a shorter version of the legal arguments in the original complaint he would submit that letter along with a copy of the complaint video, to the California Attorney General’s office with CHP’s request that the A.G. write back and address the legal arguments. This was CHP’s way of addressing the legal arguments. Shortly thereafter Mark wrote and sent to Capt. Iketani a much shorter letter (about 5 pages) which didn’t ask for a yes / no on the specifics of the October 9 incident but rather made some statements as to how the law works in general. The question was, in each case, is this true or false? Granted the AG could provide some clarification and elaboration, but the idea was to put this in a format that would be easy for the AG to reply to. After some delay because of a misunderstanding, Capt. Iketani did send this shorter letter of the legal arguments to the AG’s office. We are still awaiting the AG’s reply, and having some doubts as to whether the AG will, in fact, reply. We are optimistic now about the future of freeway blogging in Davis. We will continue to look for more people to join us. Freeway blogging can be used for any cause. Just make your banner say what you want it to say. Feel free to ask any questions you have about freeway blogging. Info at freewayblogging dot com.